A "Regular Expression" (aka regex), is a formal way of describing sequences of characters in strings. They are useful when other string manipulation functions run out of gas. In most languages there is a function that will answer, "Does this string contain the substring 'xyz'?" But you might want to know, "Does this string contain the substring 'network' following anywhere after 'slow'?" Regex are powerful, but almost totally unreadable. I don't recommend them where there is a reasonable alternative. Things they are good at include advanced search and replace and string splitting. You've now seen many of the features of standard regular expressions including escaped characters (the \t is the tab character), metacharacters (the . matches any character), character classes ([^\t] matches any character except the tab), multipliers (the * says "zero or more" of the previous character or character class) and parenthesized subexpressions. /d[iou]g/ matches "dig", "dog" and "dug". A character class matches a single character that is part of the class. If the class starts with a caret, the class matches any character except those in the class: [^\t] matches any character except the tab character. 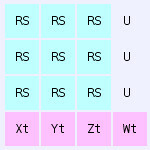 A hyphen may be used to indicate a range: [a-z] matches lowercase alphabetics. Metacharacters are characters that represent something other than themselves as characters. You've already seen most of them. The "\" in "\t" is a metacharacter. One set of metacharacters applies within character classes; another set applies outside character classes. You may precede any metacharacter with a back slash to use it as a literal: \/ is a forward slash, not an "end of regex" metacharacter.